The Lord's trip to Hadshi was preceded by His visit to Latur and Chakur in 2001. Sometimes, certain events occur in life that infuse a whiff of fresh direction and new beginnings; that restore and invigorate you in ways you would have never imagined possible. They are like splendid waterfalls in the path of a river as it flows towards its ultimate source - the ocean. They are encountered rather unexpectedly, and what unfolds as a result is something most memorable and spectacular. When the placid stream is suddenly awakened from its leisurely flow into a grand burst of intense activity, it realizes it’s potential. The most interesting thing however is that the bounding brook actually puts in no extra effort; it just 'goes with the flow'. My trip to Hadshi and Mumbai with Swami in the winter of 2009 was a similar one; it not only came as the mighty waterfall in the flow of my life but stood out as a momentous watershed for I was blessed with the privilege of witnessing, first-hand, Divinity in action from close quarters. It all began as a dream I had in the wee morning hours of October 13, 2009. The dream went thus. Swami had sent for me and I saw myself seated in the Sai Kulwant Hall about to go into the Poornachandra Auditorium. But I was also aware that only singers were supposed to be there. So I picked up a book on music, largely filled with swaras (musical notations), and headed for the auditorium. When I entered, I saw many proficient vocalists, all familiar to me, seated there. I went past Swami's chair and took my seat. When Swami questioned me about my delay in arriving, I said, "Swami, I did not expect to be a part of this group! Hence I am late!" And then I woke up. I was happy I had His darshan first thing in the morning. Beyond this, there was nothing more that I could decipher from that welcome dream. However, two days later, everything became clear. This is what I penned in my personal diary that day! What shall I write about today! It was the most exceptional day when I think about my physical proximity with Swami. I had taken another lovely step in my journey to Him. It was in the evening that the dream I had two days ago seemed to find fruition. It all happened after Swami completed His darshan rounds and called Mr. Jadhav and Mr. Ramesh Sawant for an interview. Swami came out after a while and asked for Mr. NR. Swami then asked the boys whom He had earlier selected for the Pune trip to go inside the interview room. Then, He searched our faces and indicated Ne also to join the team. What happened next stunned me. His eyes met mine and He beckoned me to go inside as well! The students seated behind me with birthday trays got up thinking He was calling them. I was certain that He had referred to me and so wanted to quickly move up the stage. However I waited for the birthday boys to get their share of blessings and also for a second confirmatory indication. It came soon as Swami signaled again and I rushed towards the interview room via the dais. Even so, I turned to judge His reaction as I was still a bit unsure and thought – in case I was not the chosen one, Swami could still send me back! But the Kind Lord just looked at me lovingly. Now I confidently took my position in the portico. I was excited and thrilled. Indeed, even now, it was so unbelievable for me, that when J came along, I thought it was to tell me to return! But he simply said ‘Sairam’ and sat next to me. A great relief swept over me. Soon, Swami came and asked all of us to go to the interview room. I rushed ahead to take a place near His feet. Once inside, Swami told Mr. NR to take down the names. He personally asked every one present his name - all except me. Ashwath prodded me to tell Him my name on my own. However, I did not want to. Why remind Him that I was there and assure Him that it was not too late to take corrective action in case a mistake had been made by calling me in! Really, I still found it difficult to accept that something so grand as this was being bestowed upon me. Later, as He was looking at all of us, He noticed me and asked if my name had been written. ‘Ah, this was confirmation enough!’ I felt. After this, Swami told us about the trip. "Everything has been well arranged,” He said. “There are individual rooms for all and the rooms have fans and A/C too; you can use either of them. We will go directly to Pune in flight. All of you must be well behaved. Be strict in your discipline." Swami enquired about the singers, harmonium players and tabla players as well. “Too many percussionists are not needed,” He said, adding that three were sufficient. I then ventured courageously, "Swami, if there is a video cameraman, it would be nice." Swami asked whether I would not do it. I said, "Swami, I will take photos." 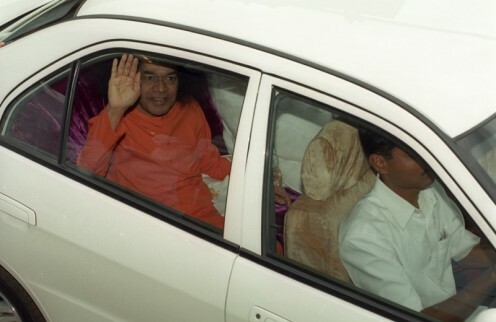 So Swami asked, "Who is there?" Swami: Does he take well? Me: Yes Swami, he takes very well. Swami: Does he have a camera? Me: Yes, he has, Swami. Swami: And what about films? Me: He has that too. Swami then told Mr. NR to add his name. As the session went on, more names were added especially of boys skilled in various musical instruments. This made me happy. Swami then enquired about speakers. I quickly raised my hand. Swami asked, "Will you speak?" I said yes and He also seemed to agree. Then He asked S as well, to which he replied that he would definitely speak if Swami so willed. I was only smiling in bliss. Then Swami noticed the clock. “How quickly time flies with Swami!” I thought. 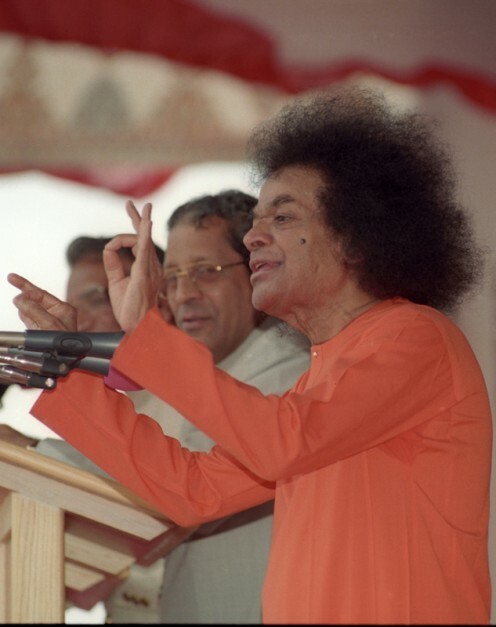 In the meanwhile, A asked Swami about the songs to be prepared to which He said that they should be in several languages. The interview was now coming to an end. As we filed out of the room, I took padanamaskar. Taking the chance to go closer to Him, I said, "Swami ee avakasam ichcharu... Chaala krutagnatalu (Swami, we are so grateful for this opportunity You have blessed us with).” He nodded. I was swimming in joy. Until that moment, though I knew about Bhagavan’s impending trip to Pune, I had never really taken the effort to learn more about the place. But now that I was flying with the Lord to Hadshi, I began to glean vital information, and in the process, learnt some amazing stories of grace from the Jadhavs – Shivajirao and Uttam. "It is a must that we know something about the place before embarking on this historic trip," I thought. It was in the early nineties that the Jadhav brothers heard about an Avatar who had made Puttaparthi His birthplace. Hailing from the faraway Marathwada region in Maharashtra, they could not come immediately for the Avatar’s darshan. 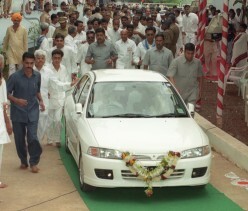 However, in 1993, both the brothers visited Baba’s ashram in Whitefield, Bangalore. They were at once impressed by the devotion and discipline that seemed to fill the air of that Holy Site, and wondered why the shrines at Pandharpur and other pilgrimage places in Maharashtra too could not be maintained that way! That very instant, they made a resolve: We will take this Swami with us to our region in Maharashtra. This was something bizarre! I had heard of people responding in different, unique ways, when they saw Swami for the first time. But in this case, merely being in the ashram had done wonders; these brothers had instantly decided to take Swami to their state! There was a grand welcome and procession when Swami eventually made the trip to Latur and Chakur..